Ragin’ Cajuns coaches and Ragin’ Cajuns Athletic Foundation leaders will join UL Lafayette President Joseph Savoie as they continue on a seven-city bus tour throughout south Louisiana and Houston this spring. 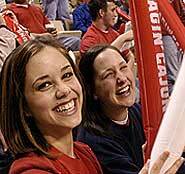 Fans and community leaders in Baton Rouge will join UL Lafayette for an intimate social with the coaches and staff to hear of the progress and future goals of Ragin’ Cajuns Athletics. Baton Rouge is the fifth stop of the tour. The event will take place at HomeBank (5302 Corporate Blvd.) from 5:30 to 7:30 p.m. on May 12. Cities already visited include Crowley, New Iberia, Houston and Abbeville. The tour will conclude in Lafayette at a later date.